The Garmin Fleet 760 offers a simple interface for easy duty status logging, and was built to withstand the wear and tear of life in a truck. The Garmin DEZL 760 offers a simple interface for easy duty status logging, and was built to withstand the wear and tear of life in a truck. Drivers choose their duty status and the device starts calculating automatically. 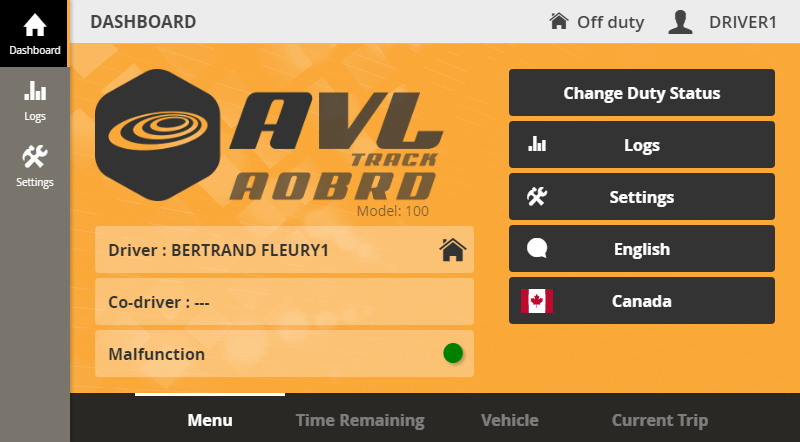 Duty status changes between "On Duty" and "Driving" happen automatically. The past 7/8 days of logs are stores locally for a DOT inspection, and the rest are transmitted to the web portal for easy access by managers. The Garmin remains in constant contact with Avltrac kto pass data back and forth, making sure the driver logs are error free.